In this article, I would like to share with you some powerful truths based on the Word of God illustrating those truths from the movie, Hacksaw Ridge. 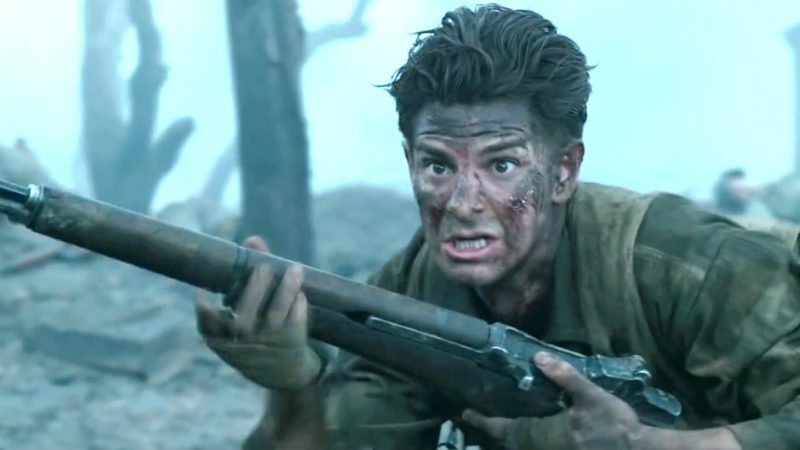 The simple prayer that Desmond Doss prayed on Hacksaw Ridge (Just one more Lord, Help me get one more) is a powerful prayer for those who wish to win souls for the Lord Jesus Christ. This article and audio message reminds us that we have a job to do for Christ. There is a war going on as surely as there was a war on top of Hacksaw Ridge. It is a real war and you are in the middle of it. It is a battle over the souls of men. The moment you got saved, you also got enlisted into the army of God. God verses Satan. The kingdom of darkness against the kingdom of light. Demonic forces and angelic forces. What are we fighting over? We aren’t fighting over money or oil or land. We are fighting over the souls of men. Satan and his demons want to bring as many souls to hell as possible. He wants mankind to completely reject God and continue in sin. He will use anything within his grasp in order to deceive mankind into believing that they have no need for a Savior. And God wants to save as many men and woman as possible. God doesn’t want anyone to perish. The prophet Joel said that there are multitudes in the valley of decision. If they side with Christ. If they accept Jesus, they will be a part of Gods eternal kingdom. If they do not accept Jesus, they will perish in a place that was prepared for the devil and his followers. You and I as believers in Christ are in the middle of that struggle. The bible at times uses military terms to describe the battle that believers are in. The bible describes us as soldiers and to put our armor on. What we must understand is that the battle we are in is not against flesh and blood. The battle we face is spiritual. The kingdom we are a part of is spiritual. We don’t take up arms in the physical sense. But none the less we are in a battle. The atheist of the world is not our enemy. We are to love them. The drug dealer is not my enemy. He is a lost person. The person of another religious persuasion is not my enemy. They have blinded by the god of this age. Our fight is not with them. Our fight is with the spiritual forces that are manipulating and controlling and deceiving them. We want them to be free. We want them to know and experience the love of God. As believers, you and I have a responsibility. We are to go invade enemy territory. We are to do our very best to rescue the perishing and care for the dying. This generation of believers is responsible for this generation that does not know Christ. Each one of us will stand before God at the judgment seat of Christ. Our works will be evaluated. What have you done for Christ? Have you witnessed? Have you loved? Have you reached out? Have you cared? How valiant are you in the battle for the souls of men? Or have you simply sat on the sidelines as if there is not a battle going on. At the Judgment Seat of Christ, some will receive commendation. They will hear Jesus say, “Well Done good and faithful servant.” The scripture plainly teaches, others will suffer loss. I want to inspire us to run to the battle. We can make a difference in the world in which we live. May God grant us renewed zeal and vigor to go forth into the world to care about those who are wounded. HACKSAW RIDGE is the extraordinary true story of Desmond Doss who, in Okinawa during the bloodiest battle of WWII, saved 75 men without firing or carrying a gun. He was the only American soldier in WWII to fight on the front lines without a weapon, as he believed that while the war was justified, killing was nevertheless wrong. As an army medic, he single-handedly evacuated the wounded from behind enemy lines, braved fire while tending to soldiers and was wounded by a grenade and hit by snipers. Doss was the first conscientious objector to ever earn the Congressional Medal of Honor. Desmond Doss was an awesome man of God. Throughout the movie you see him reading his bible, clinging to it almost, culminating in a tear jerking moment at the end when he thought he had lost his bible in the battle. Obviously, he loved God’s word. He did more than read the bible. He lived it. The reason I can say that is that he was willing to live according to what he felt the Word of God said to him in his life. He was willing to take a stand for what he believed in. He believed that he should not use a gun to kill even in war. While I don’t hold to that as a conviction. I certainly admire his willingness to stand up for what he believed in. This is our world needs today. I believe the reason why this brave man was able to run into battle without a weapon and save 75 men was because he was not a forgetful hearer, but a doer of the work. And he was blessed in what he did. If we are going to be effective in service for Jesus Christ and are going to be able to make a huge difference in the spiritual war we are in. We have to know this word and live by it. Let me ask you a question today? What convictions do you live by? Are their things you don’t do, place you won’t go, words you won’t speak? Can I ask a very personal question…how are you different from the neighbor you have who does not know Christ? There was a difference in the way private Desmond Doss lived, and the rest of the men in his platoon and in his life. His life was formed his convictions. What is a conviction? A conviction is something that the Holy Spirit convinces you of based on the Word of God. You become convinced that this is how you are to live your life. A conviction is more than head knowledge, it becomes a heartfelt belief that you walk in. Let me ask you a very important question today. Are you willing to stand up for Jesus Christ? Are you willing to read this word, and form your life around it? No matter what it costs you. No matter if it brings you the jeers of those around you. My belief is that most Christians aren’t engaged enough with the Word of almighty God. I think there are some Christians that get so entangled with the affairs of this life, that they forget that they are in a battle. They forget that they need to please the one who enlisted them. It is time to untangle ourselves and get on mission. It is time to stop playing and start serving. Private Doss was on a mission. His mission was to save as many soldiers around him as possible. He was misunderstood. He was ridiculed. He was mocked and beaten by the very ones he was trying to save. Have you ever been in a position that the very ones you were caring about were rejecting you? In other parts of the world Christians suffer greatly, are persecuted, sometimes they are beaten, sometimes they are thrown in prison. But those believers in Jesus who suffer so – many of them have come to the place where they actually do the words of Jesus, they pray for those who despitefully use them. They bless those who curse them. You don’t have to go searching for those who need Christ. They are at your job. They are at the store you shop in. They are among your family members. 1 Corinthians 13:8 tells us “Love never fails.” We must do our best to demonstrate love to the one in front of us. Jesus didn’t come into the world to condemn it. But he came to save it. He came to rescue it. I love the fact that Jesus was known as “the friend of sinners.” I love the fact that Jesus was criticized because he hung with the hurting. It is not the well that need a doctor but the sick. When I say that what I mean is that you demonstrate what it means to be a changed life. You show them that you don’t run to same things they do. You left your past life. You have a new life in Jesus. Live it out. You are a sermon in shoes. You are the only bible that some are ever going to read. 3. WE MUST RECOGNIZE THAT THE FUTURE OF THOSE AROUND US MATTERS TO GOD. I know that there are many who call themselves Christians…who do not have any passion or compassion at all for lost souls. They are underneath the satanic deception, that the only thing they need to do is occasionally come to church. They are off mission. They do not have any concern for lost souls. They don’t give money to missions. They don’t even give money to the church they attend. They aren’t involved in ministry. In fact, others who name the name of Christ really don’t like people that aren’t like them. To tell you the truth, they would really rather not be around such people. They would rather surround themselves with people who believe like them. They would rather not “get their hands soiled.” They would rather not have to hear any vulgar language. They would rather hide in their house and in their churches rather than to engage the world. Many years ago, I learned a poem. I scribbled it in the back of my bible and for years I have wanted to live my life by this poem. It was first written by C.T. Stud a missionary in the 1800’s. Steve Camp has written a song about this poem as well. One of the things this movie shows us is that people matter to God. And if they matter to God, they should matter to us. May we never come to the place where we stop sharing the gospel of Jesus Christ. God has done so much for so many of us. We have cars and houses and great jobs. Imagine receiving all these blessings from God: a nice family, a good marriage, material goods, and then miss the main point of the book! The main point of the bible is that God is reconciling the world back to himself through Jesus Christ. That is why we must say with Desmond Doss: Just one more Lord. The greatest privilege that we have is rescuing lost souls. While we may never have the opportunity to save someone’s physical life. We do have the opportunity to impact them spiritually. When Desmond Doss saw the wounded on the battlefield of life, he said just one more Lord. Can we do any less with men and women and boys and girls perishing all around us? Desmond Doss was a hero in the physical war he was in. Are there any Desmond Dosses out there who would carry the same passion for the lost and broken and hurting of our world? Hacksaw Ridge shows us the importance of being involved in the spiritual rescue of men and women bringing them to Christ.